Cannabidiol, better known as CBD, has been all the rage since it’s legalization in the states. The buzz about it has travelled quickly but there is still some confusion on exactly what it is and what it does. Cannabidiol is extracted from the flowers and buds of cannabis or hemp plants. Rest assured because unlike its cousin tetrahydrocannabinol (THC), it does not produce intoxication; marijuana’s “high” that is caused by the chemical. So then what is all the hype about and why has CBD become the hot new product over the last few years? Imagine all the benefits people are linking to the cannabis plant, but with none of the mental effects. Time and again, CBD has been found to have numerous health benefits. One of the primary uses is combating inflammation. Many use it in the form of hemp oil to reduce swelling. 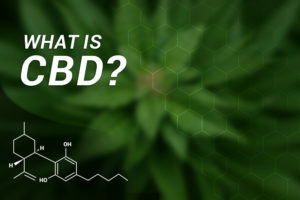 Studies1 that have been conducted have linked CBD with anti-inflammatory results and it is why several athletes and people across the population have been swearing by and using the product. Another issue towards the top of the list that CBD oil has been known to treat is anxiety and depression. There is some anecdotal evidence that points to CBD users feeling a shift in their nervous system towards more positive moods. This mood regulation can be due to the CBD interacting with Seratonin, GABA (Gamma-Aminobutyric Acid) and certain types of neurotransmitters. Pain relief is another benefit that CBD users have experienced. When inflammation is limited in the brain and nervous system, it can cause pain to subside. CBD also stops the body from absorbing anandamide. Anandamide is a compound associated with regulating pain so increased levels of it in the bloodstream may also reduce discomfort. Neck Pain, Low Back Pain and Headaches are all examples of pain helped by CBD. Since CBD has the ability to reduce anxiety, it can also help improve sleep quality. It can increase overall sleep amounts, and improve insomnia especially in cases where people suffer from chronic pain. Yes! Assuming you are purchasing a quality product from a trusted source, CBD is completely safe and is considered to be non-toxic. CBD is non-toxic, meaning no fatal overdose levels have ever been reported. Several studies have evaluated the safety of CBD in adults and concluded that it’s well tolerated across a wide range of doses – up to 1,500 mg/day – that’s a lot, way more than the average person would need! CBD is measured in milligrams (mg) and can be added or used as a single therapy. Each person’s needs are individual and may require different dosing and strengths. Generally, Basso Botanicals CBD can take 5 to 20 minutes before achieving desired effects. We suggest starting with a low serving for the first couple days and then adjusting your serving as necessary. It’s unlikely that CBD will show up on a drug test. If you have to take one for employment, chances are they will be screening for cannabis. This actually means that they’re looking for the presence of THC or THC metabolites—not CBD. So go ahead and enjoy the benefits that CBD now legally offers without any angst!